Hello Everyone! I just released v0.3 demo of Kelin Kelilin game. In this game, you play as Kelin, the bunny girl, collecting of gems while running around using one-button gameplay. The star reward depends on the star pick up, the time, and the gem-collecting performance. Feedback, suggestion, or critism are very appreciated C:. Currently developing Kelin Kelilin (https://neithr.itch.io/kelin-kelilin) game project. I don't understand why there is such an annoyingly long delay from winning a level to the level select screen when it seems nothing is even happening. Hard to judge since I do not like these types of games although I think it was not too bad. I forgot to check..I think I averaged 2 stars per level. Make going to the next level easier like a substate to go to next level / replay level / go to level selection. Make going to the next level easier. Not sure... I would not pay for the game although I like fast paced strategy games. Also sorry for the long delay, will fill that with the substate to go to other level including making to go to the next level easier. Kelin v0.3 demo is released this month finally! Also the screenshots have been updated to fit with v0.3 release. Added 10 more new levels. Added star pickup in gameplay. This replaces one of the rating mechanism: adds 1-star rating when completing a level. This is to prevent getting 2-stars rating too easy in a level. Added keyboard control for navigation especially title, config, level selection, and extra. 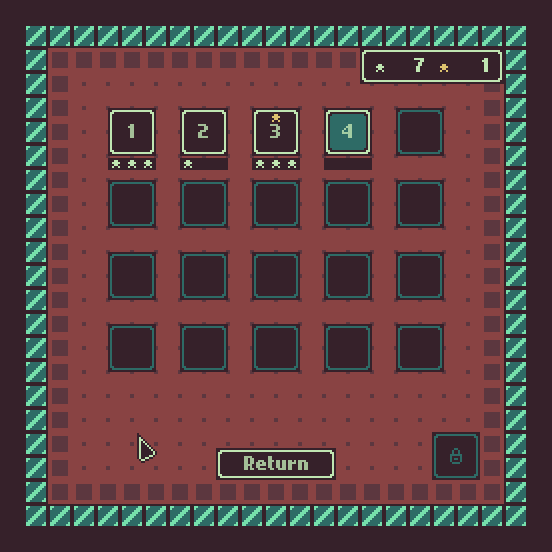 Added after-gameplay menu. This will help player to decide whether to return to level selection, retry, or next level. Added button to go to upper/deeper dungeon level. The graphic uses the sprite which was previously used for returning to the title screen. Added requirement to go to deeper dungeon level. Added highlight when hovering on a button. Added exit menu on title screen. This enables player to exit while in full screen. Changed arrangement of menu in title screen. Made Kelin visible before the start of gameplay. Added Outfit menu in extra screen. This will be enable player to change Kelin outfit. Still under contruction. Separated the time limit of time bonus and gold-time bonus. Added sound effect on keyboard control. Added current floor display in gameplay. Added clock direction and move direction display in gameplay.- Added letter shortcuts on left-top buttons in gameplay, especially for keyboard user. Rearranged some levels, gem requirement, and time bonus, especially after the star-pickup addition. Updated and added new year (2017) for copyright year. Fixed position glitch when Kelin hits wall when immeditely change direction. Fixed decimal glitch on timer in gameplay. After this update, haven't decided what to implement next. But one thing for sure that is the saving feature must will be implemented especially there will be over 100 levels in the game. Enjoy and feel free to give feedback.